That changed when his daughter, Frances, was diagnosed with autism spectrum disorder (ASD), giving direction to his career and shaping it into something that has become “incredibly valuable,” he said. 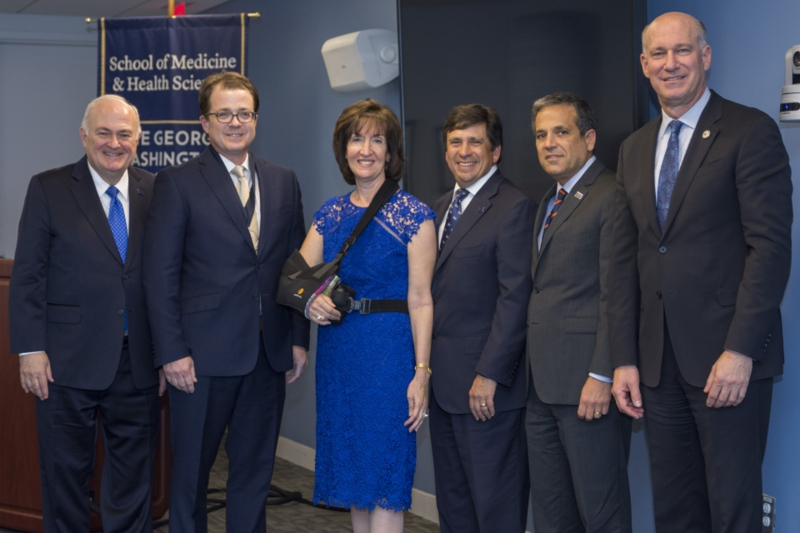 On Monday, Dr. Pelphrey, director of George Washington University’s Autism and Neurodevelopmental Disorders Institute, was installed as the inaugural Carbonell Family Professor in Autism and Neurodevelopmental Disorders, which was funded through a $2.5 million gift from the Nelson A. and Michele Carbonell Family Foundation. As much as Monday’s celebration was a professional and personal accomplishment for Dr. Pelphrey, it was also a significant occasion for the Carbonells, who shared through an emotional video the story of their son, Dylan, who was diagnosed with ASD in 1996. “I have been asked many times to talk about this story, and I have to say that I never get through it,” said Board of Trustees Chair Nelson Carbonell, B.S. ’85. The video chronicled not only the difficulties in diagnosing Dylan and supporting him as he encountered stigma and struggled in school but also his amazing artistic talent, which he is now honing at Exceptional Minds, a nonprofit animation and visual effects school and studio for young adults on the autism spectrum. It is these many years of tireless leadership that George Washington President Steven Knapp also commended. The autism research field has come a long way since the 1990s. Gerald Fischbach, chief scientist and fellow at the Simons Foundation, a private foundation that funds research in mathematics and basic sciences and provides funding for Dr. Pelphrey’s research, remembered in those years a growing awareness that autism was becoming a national and global problem. “But no one had grabbed the disease by the throat and starting shaking it and saying, ‘What is really going on here?’ ” Dr. Fischbach said. Dr. Pelphrey, whom Dr. Fischbach described as a leader in the community and a creative, generous and inspiring researcher, eventually became one of those people. And today, he and his colleagues at GW and around the world have much more work to do to advance understanding of a disorder that affects 1 in 68 school-aged children in the United States, according to the federal Centers for Disease Control and Prevention. Dr. Pelphrey, who is also professor of pharmacology and physiology, will establish a “world-class collaborative hub for translational research,” that will improve the lives of patients, said Jeffrey Akman, dean of the School of Medicine and Health Sciences and vice president for health affairs. He and his team of researchers will continue to work to understand brain functions at the root of autism, provide high-quality clinical services to individuals with autism and address issues to help create better policies for the ASD community, particularly young people with autism transitioning to adulthood.